Using the Thermo Scientific™ HAAKE™ Viscotester™ iQ and Viscotester™ iQ Air rheometers, customers can measure and analyze the rheological properties of a wide variety of paste, liquid, and semi-solid samples. The Viscotester™ iQ rheometer is an intuitive solution engineered to meet the day-to-day rheological requirements of quality control (QC) labs. The Viscotester™ iQ Air rheometer is the world’s smallest commercially available oscillation air bearing rheometer. Both set new standards in modularity, increased efficiency, ease of use, and intelligent user guidance, spanning from simple viscosity determinations to complex rheological investigations. The development of the next generation Viscotester was compelled by the demands of new rheological tasks in QC. 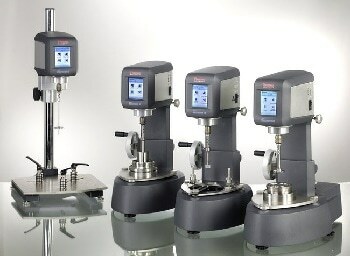 With the HAAKE™ Viscotester™ iQ rheometer, Thermo Scientific™ combines several years of experience in rheology with solutions designed for extremely dynamic working environments. The company’s goal is to enable rapid, reliable, and precise rheological measurements with maximum ease of operation. Presently with the HAAKE™ Viscotester™ iQ Air rheometer, Thermo Scientific™ offers customers the smallest available oscillation air bearing rheometer. Both rheometers can be used as a standalone portable unit or as a totally software-controlled part of one’s QC lab.